Of course, that hasn’t stopped Chang and Josh Pinsky, the chef of Momofuku Nishi, from trying: Their unorthodox take replaces the traditional Pecorino Romano with a more Changian form of umami, a creamy, cheesy, proprietary paste made from fermented chickpeas (thus the dish’s name, ceci e pepe). 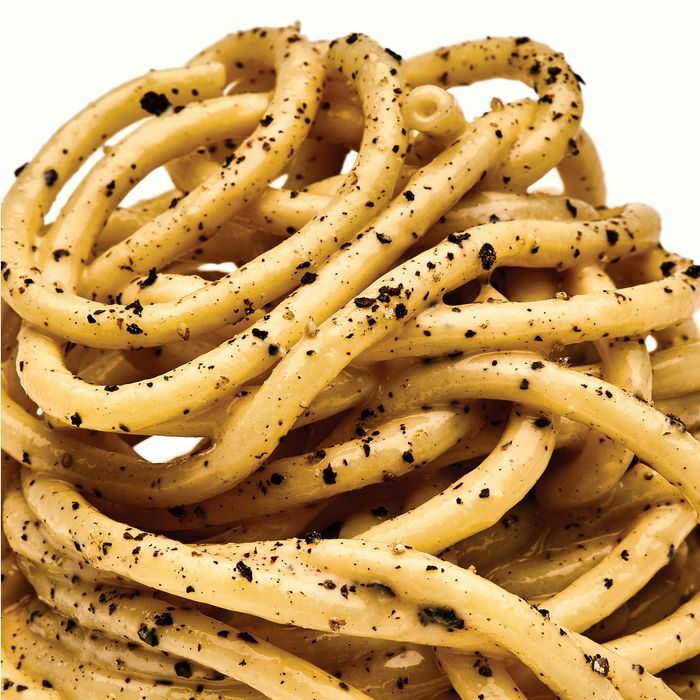 The result is remarkably true to form, and only the latest in a surge of foods that treat cacio e pepe as a touchstone rather than an inviolable recipe. You’ll still find classic renditions all over town, of course. But you’ll also find the flavor profile applied to more unusual canvases: the communion-wafer-like “hostino” that begins a meal at Del Posto; softly scrambled eggs at Maialino; frittelle at Missy Robbins’s new Lilia; pizza at Otto; and arancini at Eli’s Essentials Wine Bar. Starchy sides take well to this treatment, be they orzo at the new downtown steakhouse Quality Eats, or house-milled polenta at Hearth, whose owner, Marco Canora, also provides a recipe for cacio e pepe popcorn in his cookbook A Good Food Day. And then there’s the modernist wine bar Mulino a Vino, whose kitchen makes savory dough­nuts out of spaghetti and fills them with cheesy, peppery cream. Can Cacio e Pepe Doritos be far behind?